-186568. Composed by Johannes Brahms (1833-1897). Choral Works (inc. Oratorios). Op. 45 (Text Language: German). Romantic Period. Vocal score. With choral notation and piano reduction. Opus 45. 96 pages. Duration 01:10:00. Edition Peters #EP3672. Published by Edition Peters (PE.EP3672). Ein Deutsches Requiem (Piano/Vocal Score; (German). This is the edition that the choir conductor uses so I ordered 2 for my wife and her friend a few days before the first rehearsal. The copies arrived the day of the second rehearsal - pretty great for standard delivery to Canada. in great condition. Thank you very much! 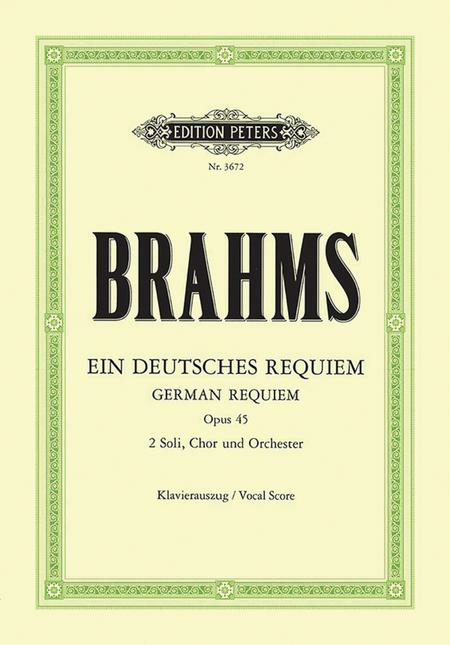 The choral group of which I am a member is planning to do this work (in German) in December of 2012. I wanted a head start so that I could learn the German pronunciation during the summer. This edition is very clear and helpful. 44 of 69 people found this review helpful. 38 of 59 people found this review helpful. 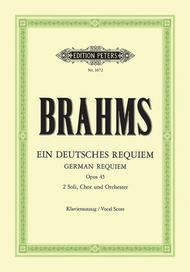 May 29, 2012 Brahms Requiem Peters ed. 34 of 98 people found this review helpful.